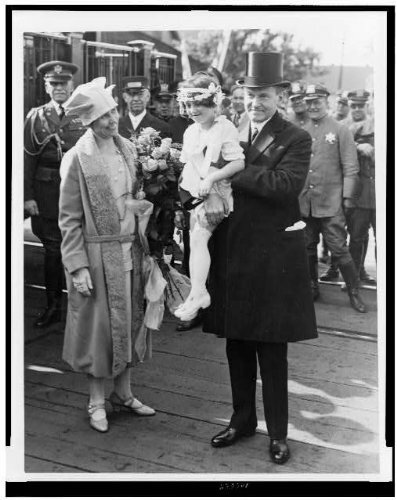 En route back to the Homestead at Plymouth, the President and Mrs. Coolidge are reconnecting with family roots, leaving most of the artificial world of Washington behind and keeping closer to realities, where the country lives, works, worships and creates. Here rested the body of his father, recently buried in March, his youngest son, who passed two years before, his stepmother, sister and mother, surrounded by the generations who preceded them of the Coolidge family. Here was a wholesome relief from the political mentality of the District to the comfort of hearth, surrounded by the family he loved, the hills he cherished and the tasks awaiting solutions on the farm. As much they desired to the contrary, they ceased to be “ordinary” citizens and could no longer “use the regular trains which are open to the public.” Looking back on the years, he once wrote, “While the facilities of a private car have always been offered, I think they have only been used once, when one was needed for the better comfort of Mrs. Coolidge during her illness. Although I have not been given to much travel during my term of office, it has been sufficient, so that I am convinced the government should own a private car for the use of the President when he leaves Washington. The pressure on him is so great, the responsibilities are so heavy, that it is a wise policy in order to secure his best services to provide him with such ample facilities that he will be relieved as far as possible from all physical inconveniences. It is not generally understood how much detail is involved in any journey of the President” (Autobiography pp.217-8). These intricate arrangements meant expense to the rest of the country, costs of going long distances with the Presidential retinue which made it prohibitive in Calvin’s high sense of propriety and moral obligation to the people for his office. It was not simply okay that gratuitous travel was chargeable to the public Treasury, even when prosperous times could have handled the burden. It was enough to escape from the National Capital every summer, to get away to Plymouth as often as possible and to keep other travel limited to specific destinations instead of the flagrant spending of continual cross-country tours or incessant vacations to luxurious places. It is telling that the Coolidges, who wanted to travel more, would not take that coast-to-coast trip until in retirement as private citizens again. However, there is something more compelling than the singular dimension of a President morally committed to economy at its most practical, personal and ideal. What prompts him to support a government-owned private car for Presidential use is not to enhance official dignity, endorse government ownership in general nor is it to live grander than the hoi polloi, but it is to “secure his best services.” We have, after all, hired him to accomplish a task of leadership, we have delegated power for a limited time with specific ends, contractually obligating ourselves and the President to obtain the best within him while we exercise the best within us as citizens. It is for this reason he is compensated with such means of private travel, not to abuse it but in pouring it back into better and better public service, he is upholding the terms of that sacred agreement. By obtaining “the best of his ability” he upholds his oath to God and man and justifies the public faith entrusted to his care. Leaving the social dramas and political flurries of Washington for the comfort of being at home surrounded by America’s people and countryside, is it any wonder that they are smiling? 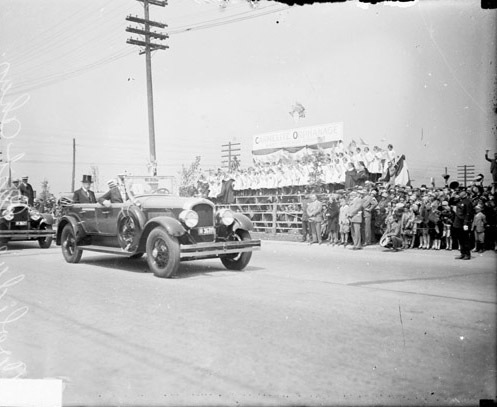 The Coolidges arrive in Hammond, Indiana, on Flag Day, June 14, 1927. 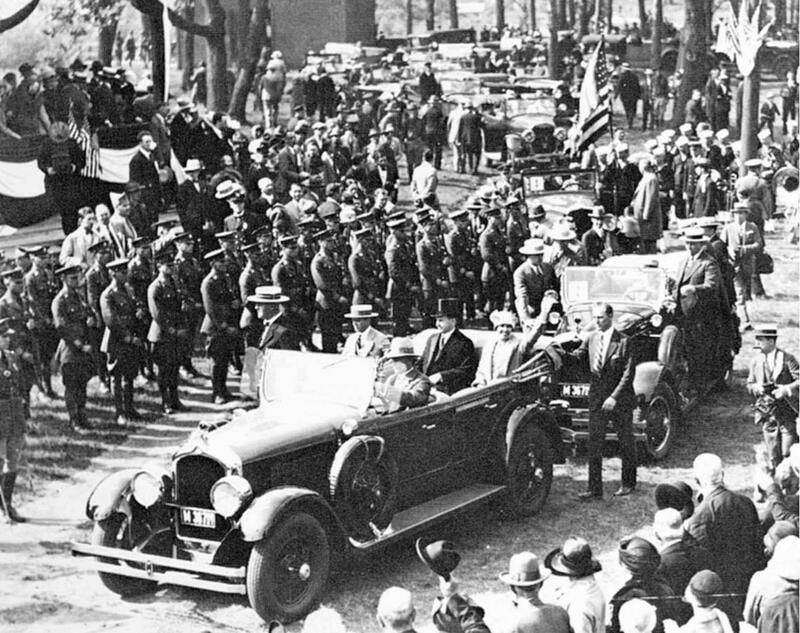 When the enormous delegation from Hammond, Indiana, stepped off the train and went to make their request at the White House on March 11, 1927, little would anyone realize the significance their visit would have on the future or the power of the statement it represented. They had not come to request money, propose an appropriation or even lobby for Federal patronage. They had come with something far more altruistic and responsible in mind. Instead of what they could get from Washington, they were inspired by what they could give, how they could promote, not themselves, but the efficacy of solvent local governments, civic-minded neighborhoods and proactive citizenship. Ever determined to pay their own way, they arrived not with the expectation of political or monetary reimbursement but to approach the President as their equal in citizenship. Quietly honoring the sovereign balance between states, the people and their national government, the Hammond delegation invited President Coolidge, as their guest, to dedicate a 225-acre park they had already acquired, paid for and provisioned so that posterity, memorializing the veterans of World War I, would be able to enjoy both the beauty of the outdoors and the rejuvenation afforded by its opportunities for wholesome recreation. Of course, the President’s travel would cost just as would the attendant expenses of his stay. 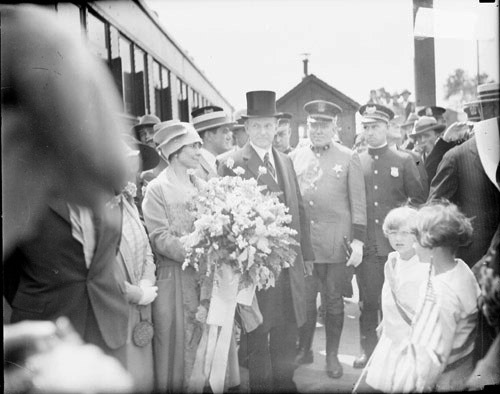 However, they knew in Mr. Coolidge there was someone who could masterfully save public money, finding ways not only in avoiding debts but amassing surpluses on even the cheapest of trips. A negotiation ensued. 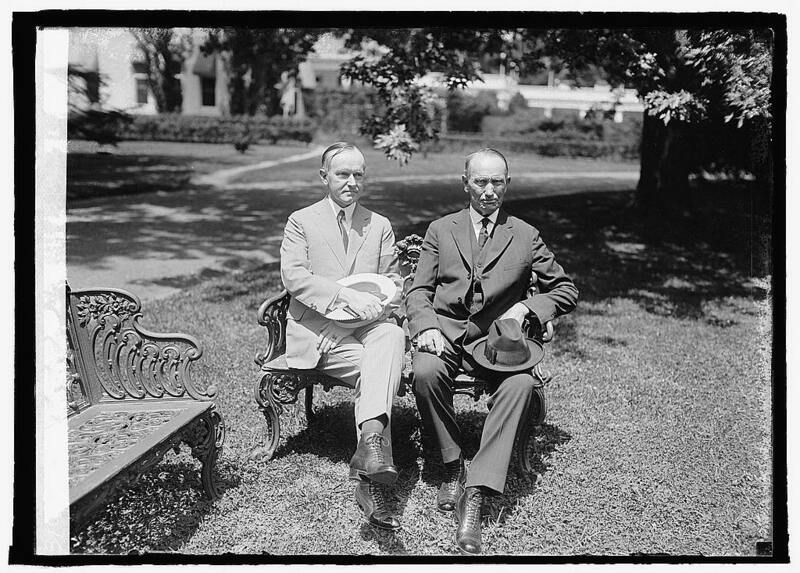 Perhaps he could give the speech that morning and “save…the trouble of going out there,” Coolidge offered. Well, that would curtail their time to speak now on the merits of their park, their neighborhoods and their people. They were here to underscore the strength of local civic participation after all. Ever respectful of that sovereign principle, Cal deferred and as the plan for his visit to their town took shape in the coming months, he would endorse their example in word as well as deed. 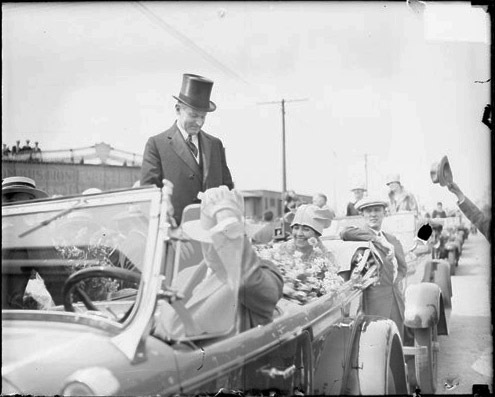 By stopping in Hammond only two hours en route to his famous stay in the Black Hills that summer, leaving immediately after the simple ceremony, Coolidge avoided the costs of accommodations, food, and the endless parade of elaborate outlay expected to accompany a Presidential visit. He detested ostentatious displays, especially at the hands of government officeholders, in part because of his own self-effacing nature but also because it always exacted a tax for which people had to work longer hours for fewer wages, seeing less a reward for themselves and more for those who have not earned it. Even on the road, Coolidge would practice economy. He would stay in unassuming places, attend rural church services rather than the grand churches of the nearest city and exercise the powers of his office to serve, not be served. The story is told of the strenuous efforts to provide a pristine washroom for the President during one of his stops on the road. Newly supplied with soap and clean, white towels, every corner of the room was ready for his arrival. Moments before being shown these facilities, however, a hot and dusty aide hurried to the room, drying his hands on one of those towels. 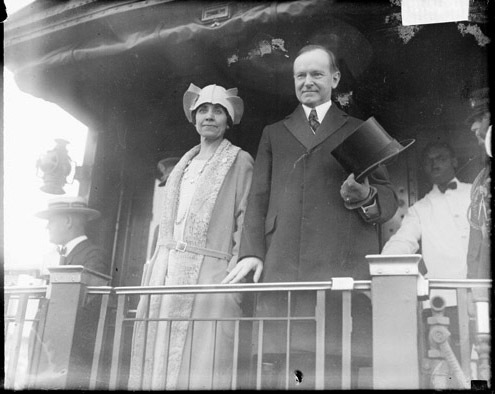 Claude Fuess recounts what happened next, “When the President was escorted to the washroom, his companion noticed that one of the towels was streaked with dirt, and proffered him the remaining one, but Coolidge waved him aside, saying, ‘Why soil it? There’s one that’s been used. 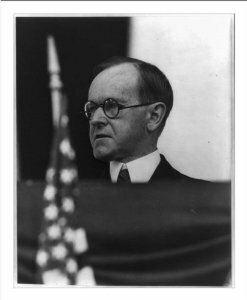 That’s clean enough.’ ” As Fuess aptly summarizes, the account would “hardly be worth relating” if not for the light that it sheds on Coolidge’s consistent sense of humility and economy (Calvin Coolidge: The Man from Vermont, pp.487-8). “This section represents a phase of life which is typically American. A few short years ago it was an uninhabited area of sand and plain. To-day it is a great industrial metropolis. The people of this region have been creating one of the most fascinating epics. The fame of it, reaching to almost every quarter of the globe, has drawn hither the energetic pioneer spirits of many different races all eager to contribute their share and to receive in return the abundant rewards which advancing enterprise can give…Here are communities inspired with a strong civic spirit moving majestically forward, serving themselves and their fellow men. Here is life and light and liberty. Here is a common purpose – working, organizing, thinking, building for eternity.” This vibrant collaboration was not instituted by government mandate, it flowered under the care of the people themselves. Moreover, it was a structure built by all races, a legacy on which everyone had left an impression and contributed a part. Such is the nature of liberty. Coolidge could easily have said the converse is equally as possible: Without a constantly replenished civic spirit, a community soon experiences death, darkness and slavery. 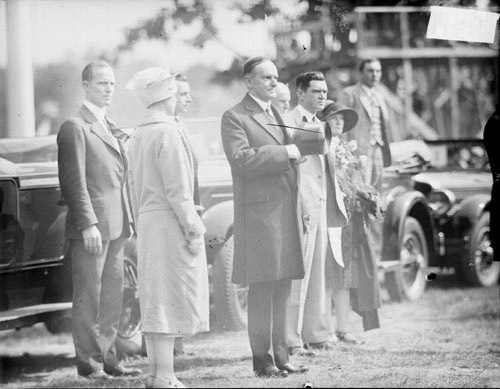 As Coolidge kept his commitment to speak at the dedication of Wicker Memorial Park, the visit of that large delegation stuck with him. He likely saw many of those familiar faces among the 150,000 who were there that day. He was not there to honor himself, he was there to commemorate the sacrifice of those who, not unlike the engaged citizens of Hammond, had done more than simply talk about what needs to be done, they got busy and did what needed doing. The veterans of the World War took up the full burden of American citizenship. It is only fitting that they were in turn honored by those ready to partake in that higher kind of devotion. 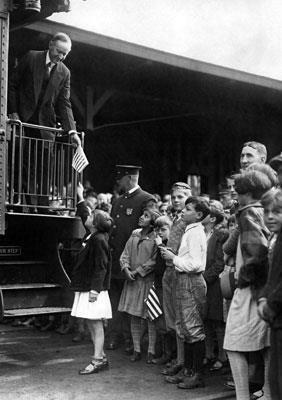 “Not the visionary variety,” Coolidge observes, “which talks of love of country but makes no sacrifices for it, but the higher, sterner kind, which does and dares, defending assaults upon its firesides and intrusion upon its liberty with a musket in its hands.” The men and women of Hammond were not lawless anarchists or violent deviants, but “orderly, peaceable people, neither arrogant nor quarrelsome, seeking only those advantages which come from the well-earned rewards of enterprise and industry.” As a result, the people of Hammond, like Americans all across the country, were simply demonstrating what it means to responsibly exercise American citizenship. 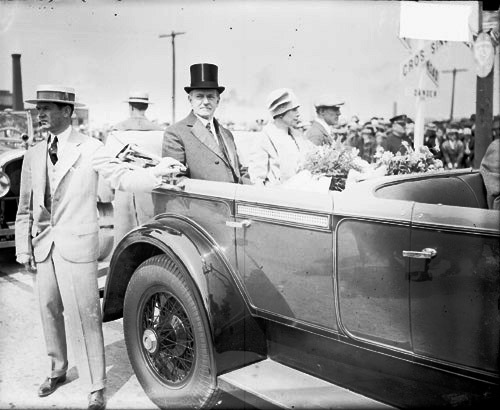 As he stepped to the podium, Coolidge’s mind would turn again to the astounding achievements of this region of Indiana, he would reflect on the rapid but substantial rise from wilderness to thriving neighborhoods, towns and metropolises. These were not developments over which to mourn, they exemplified the strength and progress of men and women engaged in their own communities, free to direct their own destinies and make their own decisions. They embodied self-government at its finest. With local obligations being met so proficiently, it made the intervention of national authority unnecessary, redundant and destructive. The better local institutions work, as the citizens of Hammond proved, the less room there remains for central government to justify its presence. This exemplary success of civic participation was not from some coincidental combination of factors in history, as if it were all by accident, it was directly a result of the daring spirit of Americans themselves. It came from the character they possessed. As the President would remark on that occasion, “It is inconceivable that it could take place in any land but America.” The very ground on which they stood was testament to that truth. It had once been a dry, sandy plain. Now it was a garden appealing not only to the mind but to the spirit of man. It was conceived and carried out not by the votes of politicians but through the effort and perseverance of citizens who recognized they had an obligation to give, not merely to take. Men like George Hammond, whose packing plant helped establish the town; or the 16 men of North Township who joined together to bequeath this large property to posterity for its practical usage in bettering people. The children of the Carmelite Orphanage enthusiastically receive the Coolidges. As Coolidge surveyed the hundreds of thousands of Americans who filled the park that day, he saw in our future not a sapping despair or delusion of cynicism but one bright with better things in store, a future resplendent with the potential of a free and actively engaged citizenry. That future, however, was conditional. If our country was to lead the way toward realizing “a world fit for the abode of heroes,” as Coolidge sincerely wanted, “it can only be through the industry, the devotion, and the character of the people themselves. The Government can help to provide opportunity, but the people must take advantage of it. As the inhabitants of the North Township repair to this park in the years to come, as they are reinvigorated in body and mind by its use, as they are moved by the memory of the heroic deeds of those to whom it is dedicated, may they become the partakers and promoters of a more noble, more exalted, more inspired American life.” He knew Americans, taking responsibility themselves rather than waiting for government to act, were more than up to this challenge. It remains for us to prove we are now. “My Dear Father: — It is two years tonight since you woke me to bring the message that I was President. It seems a very short time. I trust it has been a great satisfaction to you. I think only two or three fathers have seen their sons chosen to be President of the United States. I am sure I came to it very largely by your bringing up and your example. If that was what you wanted you have much to be thankful for that you have lived to so great an age to see it. (Cited from Your Son, Calvin Coolidge: A Selection of Letters from Calvin Coolidge to his Father edited by Edward C. Lathem, Montpelier: Vermont Historical Society, 1968, p.211). Calvin and his father, John, July 18, 1924. It had been barely eleven days since Calvin Jr. died.